Grey overtook black to become the most-popular colour on new cars registered in the UK. That's according to data released today by the Society of Motor Manufacturers and Traders (SMMT), which reveals that nearly half a million grey cars were registered in 2018. It's the first time grey has topped the charts since records began. In 2017, black was the UK's favourite car colour. Before that, white was number one for four consecutive years. More than half (59 percent) of all new cars in the UK last year were finished in black, grey or white - with no primary colour making the top three for eight years. It's unusual that grey is number one as, in most cases, it's an optional extra on new cars. 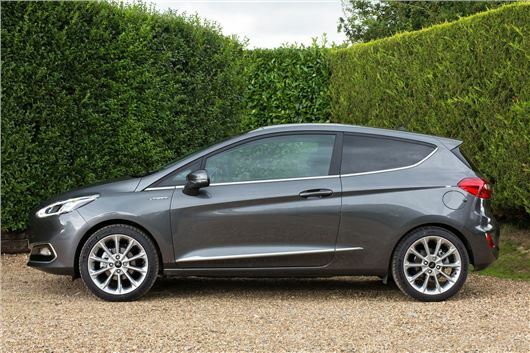 It was a favourite amongst buyers of Britain's best-selling car, the Ford Fiesta, last year - despite costing an extra £650, making it one of the most expensive colours available. On Britain's second best-selling car, the Volkswagen Golf, grey is available as a no-cost option - which might explain its popularity - but it's a £565 extra on the third most popular car, the Vauxhall Corsa. UK new car registrations were down by 6.8 per cent in 2018, which translates to a fall in popularity for most colours. Despite taking the top spot, the number of grey cars registered actually dropped by 1.1 per cent compared to 2017. Orange and beige both saw a boom in popularity, with registrations of each soaring by 37 and 28 percent respectively. This meant orange jumped up to seventh place, while beige made its first appearance in the top 10 since 2014. Yellow took a hit, falling by more than a third (34 per cent) - as did cream, with just 559 car buyers opting for this colour in 2018. People are still buying beige cars? I thought that went out of fashion by the mid 1980s. That, and brown cars and vinyl roofs. Why do some manufacturers have a single stock colour and make all other colours an additional cost add-on? Modern manufacturing practices means that swapping colours can be done at little cost, so there should not be any excuse for an extra charge for a similar type of finish - other than an opportunity to make additional money (car companies do try to be profitable!). But a stock colour with different colours at a cost of £500+ extra can result in a lot of cars in the basic colour. This must lower residuals and probably does not enhance the perception of a model if there are lots in, say, white. To increase their profits of course!!! Because the dealer NEVER has the basic (ie no extra cost) colours in stock, so "we have that model and extras, but in metallic green (or whatever) gets a sale. Grey isn't very visible compared to white but with the EU legislated daytime running lights that's not so important. Grey is my favourite colour as it doesn't show up the dirt and only needs washed once a month. I have had a black car and a white car in the past and they were always dirty the day after being washed. Black and grey really help those people who don't put their lights on until it is nearly dark (about 5pm around here this time of year). Let's be invisible. These surveys are a bit of a nonsense, most 'mass market' cars have a limited range of colours, with only one or two shades actually being 'free', you pay extra for the rest. Indeed in that 10 or so colours you can choose from, two or three might be variations on silver or grey anyway. If you discount black & white, always included, yet both show the dirt too quickly, reds that tend to fade, greens because someone in the family thinks it's unlucky, the choice becomes very limited. I'm astonished at 'beige' still be bought, I don't recall seeing a beige car for years, aside from 80s 'classics'. Which makes & models make up 26,042 orange cars as they seem more rare than yellow?